ABC3 premieres Steam Punks, a new kid’s game show, this month featuring triple j’s Paul Verhoeven as ‘The Inquisitor’ in a bizarre subterranean world controlled by the megalomaniacal ‘Machine’. To win their freedom, two teams of two ‘Inquisitives’ go head-to-head during each episode as their problem-solving skills, scientific knowledge and their ability to interact with technology are put to the test. The winning teams are deemed Steam Punks and transported back home. The losing teams become The Machine’s minions and are stuck in the catacombs forever! The Quizatorium: The teams must answer multiple-choice science-based questions. There are picture clues and some answers include spectacular footage of crashes and explosions. The Storeroom: There are five different storerooms that the teams encounter, with each storeroom testing one of the five senses. 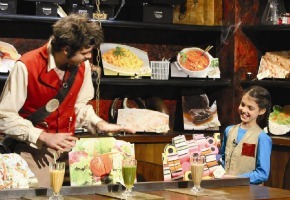 The unsuspecting Inquisitives will need a strong stomach as some of the concoctions created in The Storeroom can get pretty disgusting! Bang, Crash, Splat, Splash: During this round the teams must predict the outcome of some jaw-dropping experiments conducted by Steam Punks graduate, Marvin. Be prepared to be amazed as Marvin uses giant water tanks and enormously powerful cannons. He even drops the occasional car from a great height just to hear how loud it sounds. Feed the Furnace: During this fast, gooey and hilarious challenge one member from each team must hurl coal into the furnace while tied to bungee ropes. But to make the round harder for The Inquisitives, the opposing team sprays thick pungent goo at them. Prepare to laugh as The Inquisitives slip, slide and are flung backwards while being covered in goo! Fast or Last: Finally the teams must compete in a quick answer round using hammers to bash their buzzers. Who will earn their freedom and the right to call themselves Steam Punks, and who will stay in the catacombs forever? Updated: 5:25pm Sunday, 17 February ABC3. To start with, thought it sounded a bit like CBBC’s Trapped that also aired on the ABC. Realise now there are more differences than I thought.